UPPER WEST SIDE — A mysterious series of surrealist sculptures has left Broadway pedestrians and motorists puzzled. The seven sculptures, found along Broadway mall at 57th, 62nd, 72nd, 73rd, 79th, 117th and 157th streets, popped up earlier this month without signs or an official unveiling — leaving some in the area to wonder about their origins. 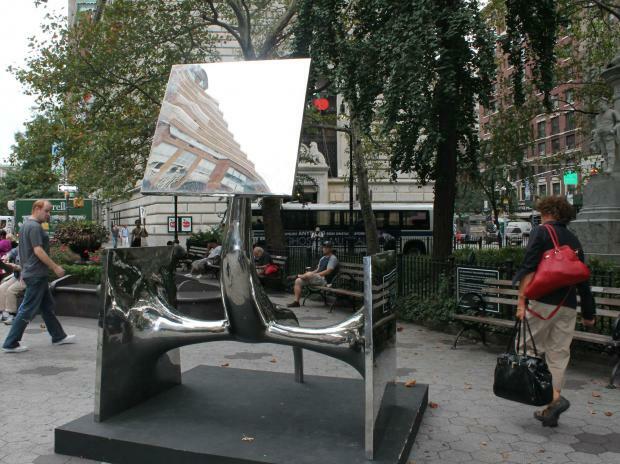 The installations are the work of the New York-based Brazilian artist Saint Clair Cemin, 61, and were installed by the non-profit community beautification group the Broadway Mall Association, with the support of the Parks Department and the Department of Transportation. The sculptures — which were created between 2002 and 2008 — will be on display through mid-November. The works have sparked curiosity in the neighborhood because there's no information posted about the artist, the title of the work and an explanation of why it's there. That will be changing in the next few days when placards detailing the art are put up, according to Deborah Foord, a BMA board member. The largest sculpture, Vortex, stands at 57th Street and Broadway, one of the busiest intersections along the pedestrian mall. Towering 40 feet in the air, the sculpture rises like a giant mirrored shard of glass, or an icicle. At 72nd Street, in the plaza outside the subway station, straphangers let their eyes flit over Cemin's small bronze pyramid as they rushed by. Linda Nelson said she didn't care for the new art, preferring the last round of pieces on exhibit. "The one that was there before looked better. It had some birds or animals," said Nelson, referring to the Broadway Mall Association's sponsorship of Peter Woytuk's work last fall, which brought life size animal sculptures to the thoroughfare. "I don't like [the new one] very much. I don't know what it's all about." At 62nd Street, Ann Pompino, an artist and local resident, paused to take in a seated figure that appeared lost in thought, Cemin's O Pensador. "It's interesting," said Pompino, "that's something I consider high on my list, that a work intrigues me." Foord said the Association has been exhibiting public art on the malls since 2004 and tries to display the work of "a high quality by prominent artists" who may not have exhibited in New York before. In 2009, the BMA introduced cell phone tours narrated by the artists. The number to call for a tour will be on the signs by the works. Six new sculptures by Cemin are also on exhibition at Paul Kasmin Gallery at 515 W. 27th St.